The Wee Reds were again in action on Sunday, this week competing in the Forrester RFC Mini Tournament in Edinburgh. All age groups from Micros to P7s were present and some great rugby was played under fabulous conditions. It was a clean sweep for Linlithgow as all four Wee Reds’ squads won their respective age groups in the Tournament! 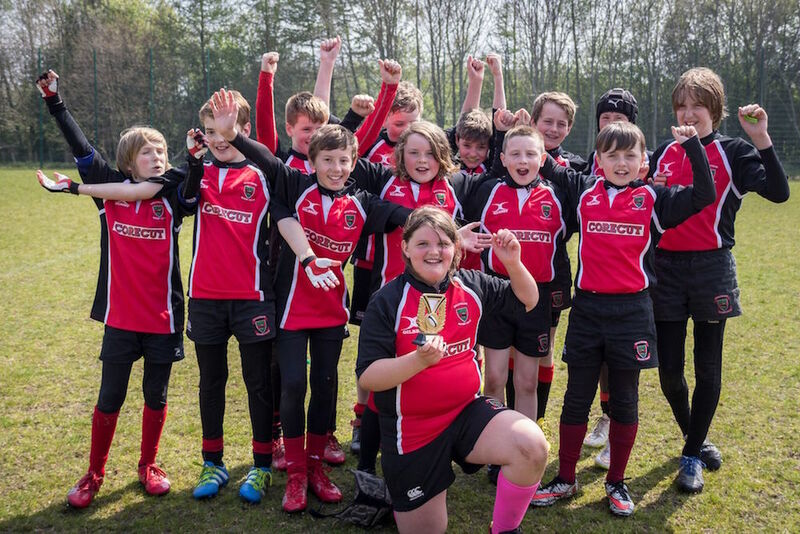 Indeed, of the 30 tournament matches that the Wee Reds Minis played from P4 to P7, they lost only one match! The micro section enjoyed a good run out at Forrester. 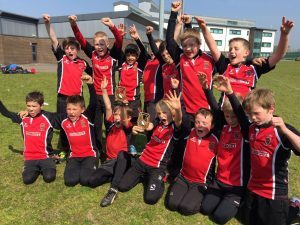 Linlithgow fielded 3 teams at P1/2 and 2 teams at P3 with every team playing 3 or 4 games of touch rugby against Livingston, Dalkeith, Lasswade, Penicuik, RHC and the home side, Forrester. It was terrific to see some great running rugby with tries aplenty and even some encouraging signs of defensive organisation from the Wee Reds! The tournament was played with great spirit and with the sun coming out to warm us all up before the medals were handed out, everyone thoroughly enjoyed the tournament. A great day and a great performance! We had two P4 teams at Forrester’s and both were undefeated having played 10 games between them. Although I know that for the boys the best thing was winning every match, for me and a lot of the parents, the best thing was seeing some fantastic rugby. Some of the matches were very hard hitting with some crunching tackles by both teams but this didn’t faze our boys at all! In offence they demonstrated some great support play, solid rucking, some perfectly timed off-loads and some real power breaking through the other team’s defensive lines. In defence, we saw some brilliant tackles, some great counter rucking and real determination even when we faced some opposing teams with players that would have looked big in a P6 team! So, my thanks to Forrester’s who put on a great festival. 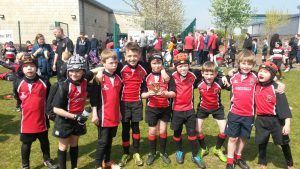 The boys had a great time and they played some fantastic rugby – the best I have seen them play all season. Linlithgow P5s played 2 balanced teams and dominated the Forresters tournament today. The boys played 13 games and won all but one. The great thing was the way we played with some of the best passing and support play we have seen this season. To have 4 losing opposition coaches come over to say how fantastic our tackling, team passing and brilliant support play makes all the coaches proud on the day. Today was the perfect example of brilliant team play for both teams and the way they all played was both skilfull and great examples of playing games the right way. The P6s went to Forrester on the back of some very strong performances at Gala and Livingston, and full of optimism from what we’ve seen both in tournament play and in training. We turned up an hour before kick-off to get the boys warmed up, and to get their “contact heads” switched on before our first game. 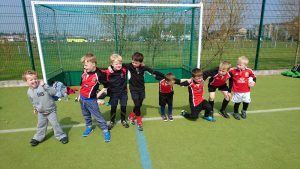 We’d started the warm up when we were told we had 4 games to play in succession – fitness was about to be tested ! 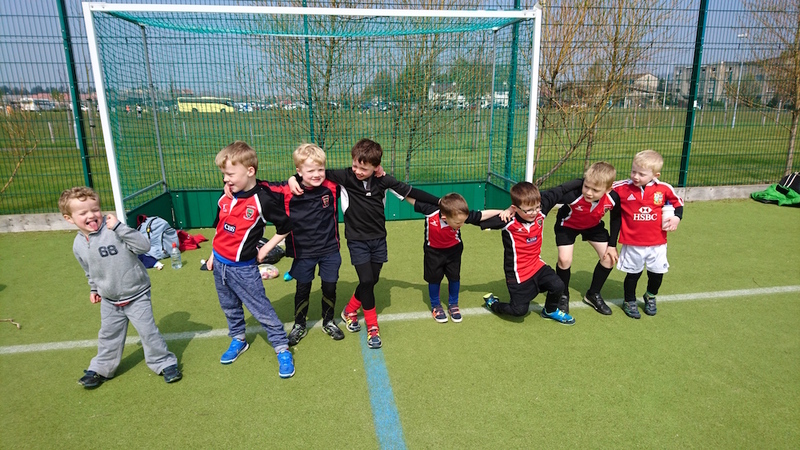 Our first game was against our hosts, Forrester, who had some sizeable players in their squad even when compared to some of our bigger lads (and our coaches…!). We shouldn’t have worried, as we started very strongly, taking a lead and never relinquishing it. The image that stands out from that match was of Cameron, one of our lithe wingers, hanging off the biggest Forrester player as he made an attacking run, eventually slipping to his ankles and stopping him. As coaches, our only improvement point from this game was that the boys were a little slow to move up in defence, and Forrester managed to get some of their bigger players running through us at pace, scoring easily. Our own attack was on form though, and the boys attacked in waves, with support runners taking the ball at pace and breaking through the Forrester lines eventually winning 6-4. Our second game was against Livingston and it was clear from the kick off that they were a very different proposition to Forrester. They had a couple of very strong runners who cut around the outside of our defence, taking a quick 3-0 lead. It was at this point that our boys showed their class, increasing the intensity of their defensive play, harassing the Livingston attack and turning over ball with apparent ease. We levelled the match with around 4 minutes to play through some strong running through the centre, particularly by Marc who seemed at points to have the entire defence trying to haul him down, and some great movements onto the wing when we had space. We scored 2 more tries, winning 5-3 in the end. The Livingston boys looked understandably dazed at the end of the match, and we were really proud of how our team had stuck to the task. We took on Royal High next and our defensive line speed and continued harassment of them when they were in possession won us lots of ball to play with. Our strike runners made the most of this and with some classy finishing we ran out winners 5-1. Finally we took on Lasswade and, despite being tired, our boys played very strongly, scoring at each opportunity and running out comfortable winners 6-1. It’s great to go to a tournament and win all our matches, however, what was particularly pleasing was the manner of our wins. Every player in the squad played their part, both in attack and defence. As coaches, we’ve been trying to instil a team spirit and degree of ownership into every player who pulls on a Wee Reds shirt. On Sunday we saw this come into effect with most of the boys managing to score or playing a key part in a scoring move. 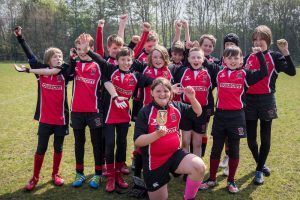 This included kids who were half the size of some of the opposition players, proving that rugby is about mental attitude, bravery and technique as much as size. There are 2 more Sunday Tournaments to go with Dalkeith this coming weekend. Let’s keep this momentum going until the end of the season boys!